A growing area of interest in the study of plants in relation to criminal investigations. 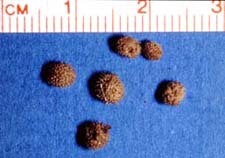 Analysis of plant parts like the of Galium fruits (photo, right) from a murder scene can be useful in forensic studies. My research combines approaches from biology and the earth sciences, and focuses on reconstructing past environmental changes in western Canada. Using a variety of techniques such as pollen analysis, plant macrofossil analysis, and radiocarbon dating, my collaborators and I are working to understand the postglacial recolonization of trees and other plants from glacial refuges to produce the vegetation mosaic of today. Changing climate and its effects on past forest patterns and wetland distribution are of particular interest. Results from our investigations are of interdisciplinary importance, and are widely used by geologists, archaeologists, climatologists, and resource managers as well as biologists. My current emphasis is on the postglacial history of coastal British Columbia, particularly the Queen Charlotte Islands, continental shelf and at the subalpine/alpine transition in the mountains. Geological and fossil evidence on the "Canadian Galapagos" is being analyzed to try and resolve the controversy of whether or not a refuge for plants and animals existed there throughout the last glaciation. Reconstructed changes in vegetation and climate over the last 15,000 years provide insights into the possible consequences of future environmental changes due to global warming. For example, data for a particularly warm and dry interval around 8-9,000 years ago indicate that fire frequency was dramatically higher, forest composition changed, and many wetlands dried up completely. Similar effects can be predicted for the future. Significant disturbance events such as volcanic eruptions and large earthquakes can also be studied by paleoecological techniques, and new approaches to reconstructing earthquake history using pollen and plant macrofossils are now being developed in my laboratory. A fossil pollen grain of Jacob's-Ladder (Polemonium) in the light microscope, compared to a modern pollen grain as seen in the Scanning Electron Microscope. Both magnified 1,000X.